The Anderson House in Washington, DC is an incredibly beautiful wedding venue. Built in 1905 by Ambassador and Mrs. Larz Anderson, the stately home became DC's most fashionable home. The home was built to be "a grand setting where a rising diplomat could entertain American and foreign dignitaries." The home now features not only beautiful proportions, nut it is filled with an incredible collection of antiques. More importantly for me - the light in the home is absolutely spectacular! When Bahar, Michael and I first started discussing their wedding and I was introduced to the the venue, I immediately was over the moon! I arrived to DC on Friday afternoon and met Bahar and Michael at the Anderson House where, after their rehearsal, we did an Ethiopian engagement session. I knew the contrast of their incredible, ornate and colorful costumes against the Florentine Villa's style would create the most beautiful engagement session images. Using the beautiful backdrops, the glorious light, and their natural chemistry, we got some truly stunning images on the wedding day. For this image, Bahar was walking though one of the museum rooms and I saw this beauty about to happen. I positioned myself behind the display cases an waited for Bahar to float through the room. 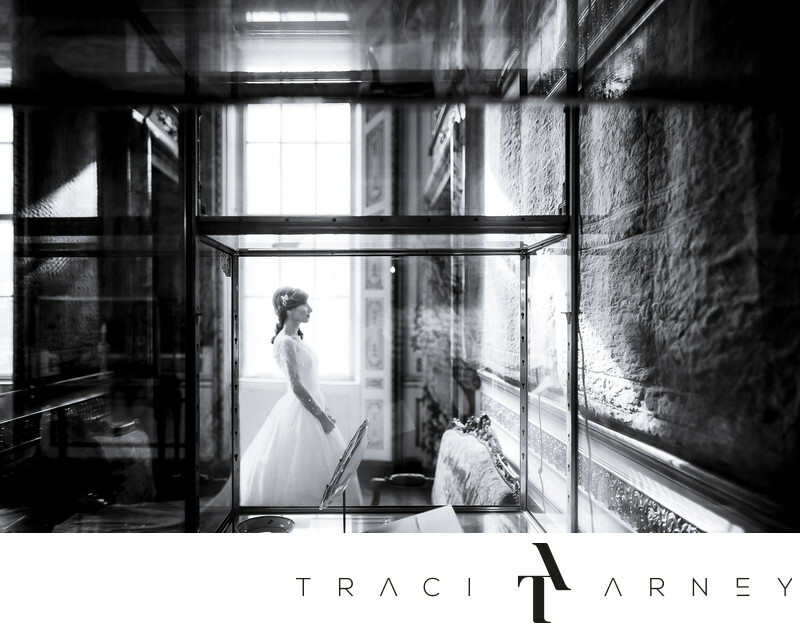 I was immediately attracted to the cubist quality of the the glass cases and how they would frame this gorgeous bride in her walk to the aisle. Location: The Anderson House, 2118 Massachusetts Ave NW, Washington, DC 20008 . Keywords: Black and White (135), Black Tie Wedding (3), Cubism (6), Destination Wedding (186), Ethiopian Wedding (3), Gown (81), Iranian Wedding (9), Multi-cultural Wedding (12), Persian Wedding (9), Sareh Nouri (3), The Anderson House (24), Traci Arney Photography (6), Washington DC (6), Wedding (465). 1/160; f/1.4; ISO 320; 24.0 mm.